Waste materials generated from agricultural, agro industrial, agro forestry, aquatic bodies, and domestic sources cause severe environmental pollution. These wastes can be recycled and utilized by converting them into compost. Compost is a valuable fertilizer product useful for higher production of agricultural crops. Further, organic fertilizers can be substituted for chemical ones to benefit the soil and produce agricultural items which are free from harmful elements. 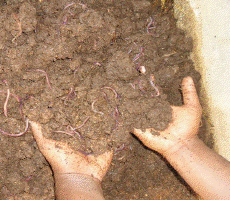 The vermin-composting procedure developed at IIT Kharagpur produces manure which is rich in the essential ingredients and has a greatly reduced composting time.. Factors responsible for quick decomposition of organic wastes like moistures, temperature aeration and pH of substrate media is controlled. The maturity of compost varies with C: N ratio of substrate, environmental factors and the type of decomposer used. The efficient decomposer identified for composting and improved strain of cellulolytic and lignocellulolytic microorganisms and exotic species of earthworm. Various structural design of vermicompost unit is developed for household as well as commercial purpose with provision for environmental control system. The process generates two products: solid vermicompost and liquid vermiwash. Both the products are rich in all major and minor nutrients, enzyme sand hormones. These have been vigorously tested in the field and excellent results have been reported in case of field crops, vegetables, horticulture, floriculture and medicinal plants.